Count Albert de Belleroche was born in Swansea on 22nd October 1864. Of Huguenot descent, he was a British subject with a French title - from one of the most ancient and noble of French families. In c.1940 - in the early part of the Second World War - he moved from his home in Rustington in Sussex to Southwell in Nottinghamshire - probably to be near his friend, the Ven. J.P. Hales, Archdeacon of Newark. There is evidence that his wife, the Countess Julie, and daughter Alice were both in Southwell with him (see highlighted sections in the 'Postscript' below), and so possibly his two sons, William and Harry, may also have been resident. It was whilst in Southwell, in mid July 1944, that Count de Belleroche died. His burial is recorded in the parish register of Southwell Minster on 17th July 1944 when his age is given as 79 years, and his address as the Crown Hotel, Southwell. The funeral service was conducted by Archdeacon Hales. "The death has occurred at Southwell, of Mr. Albert de Belleroche the well-known lithographer and painter. He was 80 [sic]. "Born at Swansea he was educated partly in England and partly in France. His recreation was research on the reproduction of sound. "Mr. de Belleroche’s home was in the old 13th century manor house at Rustington, Sussex but he had lived for two years at Southwell where he had the opportunity of meeting his 60 years-old friend, the Ven. J.P. Hales, Archdeacon of Newark. "Examples of the work of Mr. de Belleroche are to be found in all the leading art galleries. Some of them were on view at the contemporary British art exhibition in Nottingham in 1942. This was one of a series of successful exhibitions organised by his son, Mr. W. de Belleroche, art director for the National Council of the Y.M.C.A..
"The funeral took place on Monday at Southwell and the service was conducted by Archdeacon J.P. Hales. "The late Albert de Belleroche, Chevalier of the Order of Leopold I was a painter of something more than continental repute. The foundations of his art were laid by the well-known French painter, Carolus Duran, under whom he studied in Paris and he went on to win high honours not only in the Paris Salon but in many of the principal salons and exhibitions in Europe. He was best known perhaps for his lithographs by which he was represented in exhibitions in London, Paris, Vienna, Brussels and New York, and specimens of which are to be found in art galleries all over the world. In October of 1942 his striking painting “Lady in Red” was on view at the Allied Nations Art Exhibition". Probate was granted on 29 May 1944 to his widow, Julie Emilie Maria Augusta de Belleroche. In an edition of The Newark Advertiser newspaper for 10th December 1941 (p.3) there is a report of an ARP Variety Concert in the Assembley Rooms Southwell. Amongst the performers listed is Alice de Belleroche - Albert's daughter. Count Albert's widow died, aged 75, in 1958 when her address is given as 5 Arundel Terrace Brighton. The burial service, however, was once again conducted, at Southwell Minster (recorded in the parish register for 23rd January 1958), she being interred alongside her husband (see photo). The inscription on the slab in front of the cross reads "In Loving Memory of Count Albert Gustavus De Belleroche 1864 - 1944. Also of his Wife Countess Julie Emilie Maria De Belleroche 1882 - 1958"
"The funeral service took place at Southwell Minster last week of Countess Julie de Belleroche. 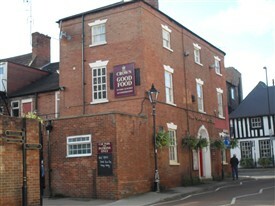 The Countess was very well known in Southwell during the war, when she stayed at the Crown Hotel. She was the widow of well known portrait painter Count Albert de Belleroche, whose reputation was gained in Paris. 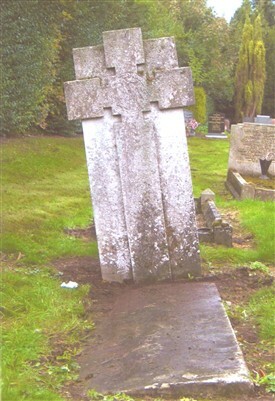 He died in Southwell in 1944. 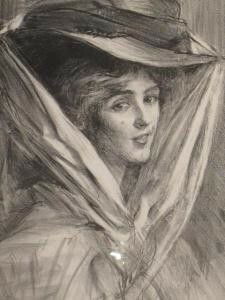 Her son Count William Edmund Henry de Belleroche is an eminent art critic". This page was added by Website Administrator on 19/06/2012.